Creates “fat moving sound” from simple tri / saw / sine or any other waveform (except rectangular). Think of it as VCO extension – exact tone tuning ensures your VCO and Animator creates 8 phase-shifted and endlessly moving waveshapes summed to Animator´s output. Sounds like 9 slightly detuned VCOs together, sounds simply FAT (8 shifted waves + 1 original from input). 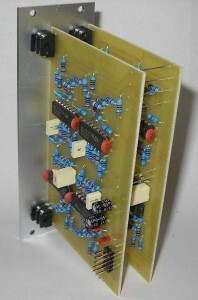 Contains 8 phase shifters drived by 8 LFOs at 8 different frequencies (34 opamps total). Try mix two waveforms in different octaves to Animator´s input (sine and triangle for example) – at Animator´s output you´ll get sound like from some kind of ring modulator but softer/milder and moving. Parallel input (2) and output (2) jacks. There is no need for setting, internal LFO frequencies are spread between 1Hz to 0,01Hz and its frequencies are set in prime numbers ratio to minimize beating. 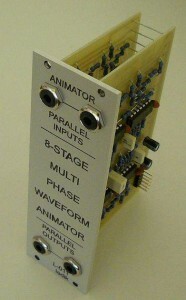 This works well in full VCO audio range from low to high and exact LFO sequence repeats in very long times (in hours). Infernal spatial sound will be heard if you´ll use two Animators for stereo (parallel inputs from one VCO, outs to left and right channel). But for following sound processing you´ll need everything twice, i.e. for left and right channel independently (two VCFs, VCAs and so on).